" The fabulous ARREL Audio ML-118 unleashes the creative power of Mid-Side processing in an extremely musical fashion. Whether enhanced stereo imaging is desired, or taming unruly elements in either the center OR the sides (but NOT both), this unit does a wonderful job in a way that most other units fail to accomplish so well." 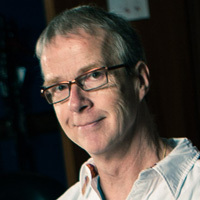 Peter has mastered over 100 albums since coming to Universal, but he has also recorded and mixed many award winning film scores and television spots since beginning his engineering career in 1981. Peter has been a staff engineer at some of Hollywood's most prestigious studios — including Sunset Sound, Capitol Records Studios, Sony Pictures Studios, where he worked as a tracking & mixing engineer. Upon arrival at Universal Mastering Studios Pete honed his skills as a mastering engineer. Some of the artists he's worked with include Miles Davis, Brian McKnight, Dwight Yoakam, Marilyn Manson, Los Lobos, Richard Marx, Dashboard Confessional, Sheryl Crow, & Harry Connick Jr.